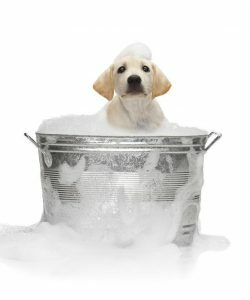 If you are a new pet owner, knowing the ways of bathing puppies is a must. If not done correctly, the puppy might get sick or even die. The age when you can give them their first bath is when they’re at least ten weeks old. Ten weeks is the minimum age, especially for small breeds. If you can wait until it is 12 weeks, it’s even better. At 12 weeks the immune system would have developed fully. If you try giving them a bath before they’re 10 or 12 weeks old, they won’t have the strength to endure it. You can start bathing puppies in a basin or even the sink. If you’ll be bathing the pup in a sink, don’t forget to put a damp cloth under it. This will keep the pup from slipping in and around the area. Only use shampoo for dogs. The ones humans use aren’t suitable for dogs. In fact it might cause damage to their furs. This will happen due to the acid and alkaline balance; it is very different from humans. Dogs are more sensitive to heat than people. Keeping the water at 100 F will be sufficient. When bathing puppies, checking the temperature is easy enough. Put your hand there. If it’s too warm, cool it down before using. After preparing the water, put the pup in there. The water level should only reach up to his upper body; make sure the head is above water. Take some shampoo (a coin size will do). Spread all over the body and the tail. Make certain you go through the coat. Now remove the water and replace it with clean ones. Rinse the shampoo / soap. Rinse the body twice. Those who are used to bathing puppies bathe the head last. It keeps the dog from shaking its body and splashing water. Cover the body with a towel after rinsing. Get a cup full of water. Pour it starting from behind the head. Don’t forget to tip the nose. What you want is the water to flow away from its eyes. Put some shampoo over the head. Put some beneath the chin. Keep the shampoo from the eyes, nose and mouth. To rinse, pour water from the back of the skull. Pour using a cup of water. Just keep pouring it until all the shampoo is gone. Drying can be done with a towel. If you want to use a hair dryer, be sure to set it low. Don’t turn it to medium or high. Make sure the air is at least 18 inches away from the dog. Only bathe the pup if it’s very dirty. Too much bathing will rob it of its protective oils. Don’t worry if you see dandruff all over its body; it is a natural body reaction. 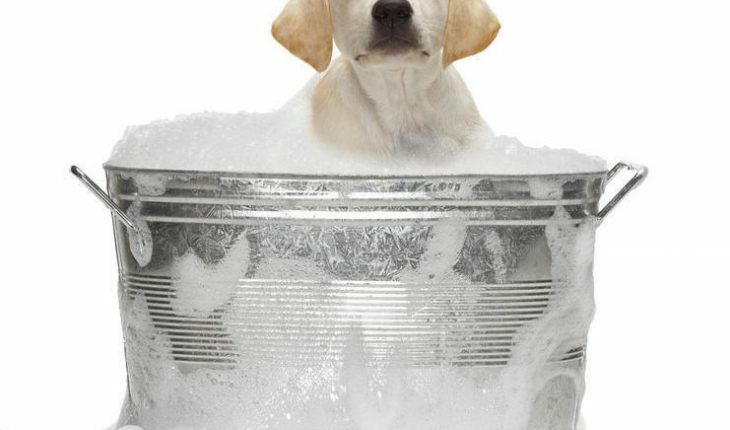 Done properly, bathing puppies can be an enjoyable time for both pet and pet owner. You’ll probably be a little damp, but that’s part of the fun.